Features aluminum front and rear suspension arms, aluminum front and rear damper towers and polycarbonate crown gear cover. This Stadium Truck is perfect for newcomers to big scale RC cars. It is fully assembled and RTR versions feature a pre-installed RC unit. Furthermore, you can choose a clear (to customize the model) or painted polycarbonate body. In its initial configuration, this Stadium Truck is very well equipped and offers superb performance and handling. A wide range of FG optional parts are separately available to enhance chassis performance. 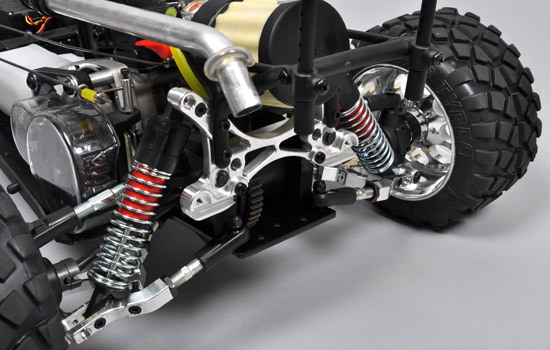 • 1/6 scale 2WD Racing Truck with double wishbone, four independent wheel suspension. • 4mm thick alloy chassis with countersunk borings. • Adjustable toe-in/out on the front axle. Adjustable camber of the rear wheels. • 4 high capacity oil dampers with adjustable spring stiffness. They can absorb the shocks of long jumps and offer an optimal road grip. • Stadium tires with inserts glued on chrome-plated rims. Enables running on all types of surfaces. • Hardened steel made transmission parts. • Fully equipped with ball bearings. • Powerful and reliable FG F260 26cc two stroke engine with pullstart system running with normal two stroke petrol-oil mixture. • Fuel tank capacity : 0.7 liters offering 40 minute running time.